Which credit card is best? In truth, there is no one-size-fits-all card; the best credit card for you depends on your personal needs, wants, and lifestyle. From cash back and sign-up bonuses to luxury perks, travel rewards and more, our experts analyzed 3,476 credit cards to narrow down the winner in each category. Explore our top picks from our partners and find the best credit card for you. A 50K mile sign-up bonus will set you on your way toward earning 2X miles on every purchase, every day, and there's no need to track your spending in particular categories. Miles are redeemable for travel statement credit, and you're free to book through discount travel sites. This card's flat-rate offer of 1.5% cash back means that your everyday spending on such items as gas and groceries gets the same treatment as bigger purchases such as car repairs. That means your rewards add up more quickly than it would with the common 1% back on all other purchases that other cards might have. 5% Earn 5% cash back at different places each quarter like gas stations, grocery stores, restaurants, Amazon.com and more up to the quarterly maximum, each time you activate. 1% Earn 1% unlimited cash back on all other purchases – automatically. This card offers huge everyday earning potential considering the 5% cash back rewards rate on rotating categories like gas, restaurants, wholesale clubs, and more (up to the quarterly max; activation required). Discover will also match all the cash back you earn at the end of your first year, which is a tough cash offer to pass up. Discover will match all the cash back you've earned at the end of your first year, automatically. There's no signing up. And no limit to how much is matched. Plus, earn unlimited 1% cash back on all other purchases – automatically. Receive Free Social Security number alerts—Discover will monitor thousands of risky websites when you sign up. Earn 2X points on travel and dining. Chase also allows you to transfer points to a number of frequent flyer programs at a one point per dollar rate. But you can truly maximize value by transferring points from any of your other Chase cards. 3% Earn 3% cash back on all purchases in your first year up to $20,000 spent. 1.5% Earn unlimited 1.5% cash back on all purchases after initial $20,000 spend in your first year. No annual fee and cash back on everything – need we say more? And because it's a Chase Ultimate Rewards card, you can redeem your rewards in more ways than most flat-rate cards. The introductory 0% APR period you'll enjoy with this card lasts for 18 months and applies to both balance transfers and purchases, then a 17.74% - 27.24% variable APR applies. With no annual fee and nearly two years of no interest, the Wells Fargo Platinum Visa is an excellent option in the 0% APR category. This card's welcome offer is hard to beat. If you travel often, you'll probably enjoy the best-in-class hotel rewards program too: Earn a whopping 10X points per dollar when you book and pay for hotels via hotels.com/venture. This card offers a lengthy intro APR period on balance transfers. The relatively low regular APR (applies after the intro period is up) provides even further cushion should you have any remaining balance. Get up to $600 protection on your cell phone (subject to $25 deductible) against covered damage or theft when you pay your monthly cellular telephone bill with your U.S.Bank Visa® Platinum Credit Card. Certain terms, conditions, and exclusions apply. The newly-revamped Savor® Card offers 4% cash back on dining and entertainment, 2% at grocery stores, and 1% on all other purchases. If you dine out often and would rather have simple cash rewards instead of points and miles, you can't go wrong with the new Savor® reward rates. The Blue Cash Everyday® Card from American Express earns 2% cash back at U.S. gas stations, with no annual fee. If you're interested in saving up front and in the long run, this card is an asset when it comes to everyday spending on gas. Terms Apply. Transfer an existing balance onto this card and you'll have 18 months to pay it off, interest-free (then 14.24% - 25.24% variable APR applies). Discover's first-year cash back match is also in play, meaning you can spend conservatively and still earn a nice reward at the end of your first year. Earn 5% cash back at different places each quarter like gas stations, grocery stores, restaurants, Amazon.com and more up to the quarterly maximum, each time you activate. Plus, earn unlimited 1% cash back on all other purchases – automatically. Receive Free Social Security number alerts— Discover will monitor thousands of risky websites when you sign up. This card will net you 1.5 points per dollar spent on all purchases; and there’s no annual fee. The flat-rate rewards structure is especially valuable considering there’s no foreign transaction fee, either. Use it to pay for your vacation and take it with you—you’ll come home to a healthy supply of points. 2X Earn 2 miles for every dollar spent on eligible purchases made directly with Delta. 1X Earn one mile for every eligible dollar spent on purchases. The Gold Delta Card offers two introductory bonuses: 30,000 miles after you spend $1,000 in the first three months, and a $50 statement credit if you make a Delta purchase in that same timeframe. Delta loyalists can count on both of these bonuses in addition to a number of signature American Express perks to make the Gold Delta card a solid play. You have options with the Ink Business Unlimited Credit Card. Either maintain a simple rewards program for your business, knowing that you are earning 1.5% cash back on every purchase made for your business with the card, or pair it with a premium card like the Ink Business Preferred and convert your cash back into Chase Ultimate Rewards points. Earn $500 bonus cash back after you spend $3,000 on purchases in the first 3 months from account opening. Help strengthen your credit while maintaining flexibility. With the Capital One Platinum card, you have the ability to choose the monthly due date that works for you. After five months of on-time payments, your credit line may increase. 1% Get 1% cash back rewards on eligible purchases including gas, groceries, and services such as mobile phone, internet, cable and satellite TV, terms apply. You’ll have the opportunity to earn 1% cash back on eligible purchases while building your credit. The flexibility to choose your own payment date and set up custom credit limit alerts also makes it easy to track your credit-building progress. Find the card that's right for you without affecting your credit score. Show off your personality by selecting from a variety of card designs, a fee may apply. Get 1% cash back rewards on eligible purchases including gas, groceries, and services such as mobile phone, internet, cable and satellite TV, terms apply. Set up custom email or text alerts so you'll always be aware of your payment due date, when your payment posts, or if your available credit runs low. Don't get stuck with a payment date that doesn't work with your schedule. Credit One Bank allows you to choose your monthly payment due date. Terms apply. Credit One Bank evaluates every account for credit line increase opportunities. We'll let you know as soon as you're eligible for a higher credit line. Know you're protected from unauthorized charges with Zero Fraud Liability—included with every Credit One Bank account. 5% Earn 5% cash back in rotating categories each quarter like gas stations, grocery stores, restaurants, Amazon.com and more, up to the quarterly maximum each time you activate. College students will love the 5% cash back on rotating categories each quarter like gas stations, grocery stores, restaurants, and Amazon.com upon activation (up to the quarterly max; activation required). Plus they get 1% cash back on non-bonus category purchases. That bonus rewards rate drops to 1% after spending $1,500 per quarter, which is just enough to cover typical college expenses without running up a daunting bill. In short, this card offers everything you need and nothing you won't use. 0% intro APR on purchases for 6 months, then the standard variable purchase APR of 15.24% - 24.24%. Rates and fees, rewards rates, sign-up bonuses, redemption options, credit needed, miscellaneous benefits, customer service, security, ease of application. When you are ready for a new credit card, you'll first want to identify which type is right for you. With the right card, you can earn hundreds of dollars a year, build your credit or enjoy special travel benefits. Here are 8 questions to ask yourself in your endeavor to choose the best card. Most credit cards, including cards for authorized users, allow you to build credit. But check with the card issuer to make sure they'll report your credit habits to the 3 major credit bureaus. Paying a lot of interest and fees? A balance transfer card helps take away the sharp edges of credit card debt, although you still need to pay off the balance before the 0% intro APR offer ends. Cards for consumers with bad or thin credit can help with this. Willing to strategize your spending? A couple of cards offer quarterly categories of 5% cash back – such categories as home improvement stores, wholesale clubs and Amazon.com. Load up on spending each quarter for rotating categories. Specific categories you often use? Some cards, such as the Amex Blue Cash cards, offer improved rewards year-round on such categories as gas and groceries. Want to use it and forget it? For those of us who don't want to think about our shopping rewards, some travel and cashback cards reward at a flat rate for all spending. If you plan to travel often (or even occasionally), some cards reward for worldwide travel and restaurants, such as the Chase Sapphire cards. Flat rate travel cards are also available. Express yourself with a card that delivers miles for using your hotel or airline brand of choice. Editorial disclosure: All reviews are prepared by CreditCards.com staff. Opinions expressed therein are solely those of the reviewer and have not been reviewed or approved by any advertiser. The information, including card rates and fees, presented in the review is accurate as of the date of the review. Check the data at the top of this page and the bank's website for the most current information. The credit cards in your wallet are some of the most important financial tools in your life. You might be on the hunt for the perfect balance transfer card. Or you could have your eye out for the right travel card offer. Whatever the reason, the best card for you awaits. 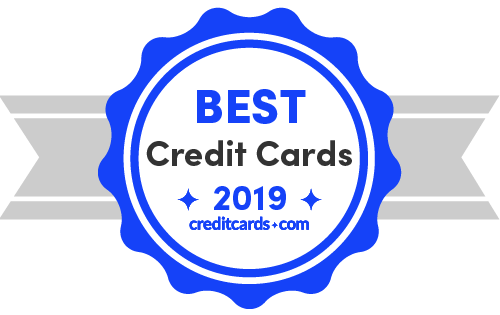 At CreditCards.com, we've compiled thousands of hours of research to help you find the best credit cards of 2019 across the most popular categories. We also recognize that there is not one single best card for all occasions; different people have different needs at different times, and the card you use at the grocery store is not necessarily the card you should use to book airplane tickets. With new credit cards constantly entering the market and offers frequently changing, it can be tough to wrap your head around all the available options. We're all over it for you. Check this page regularly for the latest information on the best credit cards and how they compare to the field – we update it almost every day! Is a credit card right for you? Is an annual fee ever worth it? Here is a summary of our top picks in an easy to read table! If you have any questions, feel free to email us at editors@creditcards.com. Most notable features: The Venture Rewards' sign-up bonus of 50,000 miles after a $3,000 spend within 3 months competes nicely with similar cards, and its $95 annual fee is waived the first year. There's no foreign transaction fee, miles don't expire while your account is active, and there's no limit to how much you can earn. Why we like it: With its large sign-up bonus, an excellent rewards rate of 2X miles on all purchases, and 10X miles for hotels paid through hotels.com/venture, this card is hands down one of the best travel credit cards, in our opinion. How to make the most of it: Note that the redemption value of your miles will vary depending on what you are redeeming them for. You'll usually want to redeem your miles for travel rewards, which have the highest value, instead of other categories such as cash back or gift cards. Note that you can also transfer your points to 14 airline partners. Also consider: For comparable features with no annual fee, consider the Capital One VentureOne. Most notable features: The Quicksilver offers a $150 bonus after a $500 spend within 3 months of card membership, which is a lower spend than the Blue Cash Everyday. Also, it features a flat rate on all purchases of 1.5% back. Why we like it: Because it offers 1.5% cash back on all purchases and has the bonus feature of no annual fee, this card lands squarely in the category of best cash back card for flat-rate spending. If you want to shop without worrying about where you are or what you're buying, this card is for you. How to make the most of it: This is a good card to use for any purchase that doesn't fall into a special category where you earn more with another card. In other words, plan on using this as your "default" credit card. Also consider: The Chase Freedom Unlimited is another good card if you prefer its higher first-year cash back rate in exchange for no sign-up bonus. Most notable features: Discover's hallmark feature of matching all cash back earned in the first year remains one of the most valuable offers in credit cards. Activate each quarter to take advantage of its 5% cash back on an eclectic mix of rotating categories up to the quarterly maximum of $1,500 in purchases. Why we like it: The return from its first-year cashback match feature can outshine the sign-up bonuses offered by competing cards, especially for heavy spenders. How to make the most of it: Make sure you set your e-mail preferences so you get reminders from Discover to activate your earning on the upcoming quarter's bonus categories. That way, you don't have to worry about missing out. Also consider: For a cash back card with constant rather than rotating categories, consider the Blue Cash Everyday Card from American Express. Most notable features: The Sapphire Preferred allows you to earn 2X points on worldwide travel and restaurants and 1X point on all other purchases. It also has a 60,000-point sign-up bonus that kicks in once you spend $4,000 within your first 3 months of card membership. Why we like it: All sign-up bonuses are not created equal – with the Sapphire Preferred, the 60,000-point bonus is actually worth $750 in travel when you redeem through Chase Ultimate Rewards. How to make the most of it: Don't forget to use the Ultimate Rewards portal to book travel with your points, and explore Chase's transfer partners to see where you can get the most value out of your points. Also consider: For another card with a large sign-up bonus and tiered rewards, check out the Capital One Savor Cash Rewards Credit Card. Most notable features: The Chase Freedom Unlimited is a reliable rewards card that earns an extraodinary 3% cash back on all purchases in your first year, on up to $20,000 in purchases. After that, it earns unlimited 1.5% cash back on all purchases, which is competitive with other no-annual-fee rewards cards. Why we like it: The CFU is a perfect choice for your "daily driver" credit card. You can transfer the points you earn with it to your Chase Sapphire Preferred or Chase Sapphire Reserve account. How to make the most of it: If you have a CSP or CSR card, strongly consider transferring points from your CFU to one of those cards, because they enjoy redemption bonuses on travel booked through the Chase Ultimate Rewards portal. Also consider: Check out the Citi Double Cash Card if you are looking for a comparable rewards card with no annual fee. Most notable features: The Wells Fargo Platinum Visa card offers 18 months of 0% intro APR on both purchases and balance transfers, after which its regular APR is 17.74% - 27.24% variable. This card has no annual fee and does not earn rewards, but it does have some additional benefits such as free access to your FICO credit score. Why we like it: The sheer length of its 0% intro period—18 months—places this card firmly on top of our list in the balance transfer category. How to make the most of it: Make your balance transfers within the first 120 days when the balance transfer fee is 3%, because that fee goes up to 5% after that ($5 minimum). Also make sure to pay off your balance within your 18 month intro APR period, because the regular interest rates after that are quite high. Also consider: The U.S. Bank Visa Platinum Card has even lower interest but requires excellent credit. Most notable features: The VentureOne card has great travel features and rewards for no annual fee. Namely, it earns 10X miles per dollar on hotels booked and paid through hotels.com/venture through January 2020. With this card, you'll also earn 1.25x miles per dollar on all other purchases. Why we like it: This card's strong travel rewards are complemented by a sign-up bonus of 20,000 miles for spending $1,000 in your first 3 months. How to make the most of it: Remember to use this card when you pay for your hotel bookings on hotels.com/venture. Go for travel rewards when you redeem the miles you've earned, as they tend to hold the greatest redemption value. Also consider: For another straightforward rewards card that earns miles, consider the Discover it® Miles. Notable features: It doesn't come with some of the bells and whistles you'd find on a rewards card, but you'd be hard-pressed to find any credit card that has a more balanced offer between a lengthy intro 0% APR period and a very low regular interest rate. This is doubly true when you look at credit cards with a $0 annual fee. Why we like it: This card is hands down our best balance transfer card thanks to its extraordinary 0% intro APR of 20 billing cycles on both purchases and balance transfers, followed by a low regular APR of 14.74% - 25.74% variable. How to make the most of it: A lesser-known feature of this card is its cell phone protection (subject to a $25 deductible); you could be covered up to $600 if you pay your monthly cell phone bill with it. Also consider: If you're a rewards fiend who's also looking for a low APR, consider the Discover it Balance Transfer. Most notable features: The new and improved Savor card comes with a generous 4% cash back on dining and entertainment, 2% back at grocery stores, and 1% back on all else. Additionally, it has one of the hottest sign-up bonuses right now: a $500 cash bonus for a required spend of only $3,000 in the first 3 months. The annual fee is waived in the first year, but it will be $95 after that. Why we like it: It's a no-brainer for foodies, and even if you aren't someone who spends a lot at restaurants, the sign-up bonus could still be worth it. How to make the most of it: Don't forget that you get 4% cash back not only on dining, but also entertainment, which includes a number of different purchases such as movies, concerts, and sporting events. Take some time to check out the card agreement to see all the types of purchases that are covered under "entertainment." Also consider: The similarly named SavorOne card is a no-annual-fee version of the Savor that comes with a lower 3% back on dining and a smaller sign-up bonus. Most notable features: Cash back on regular purchases is the hallmark of the Blue Cash Everyday, which earns you 3% at U.S. supermarkets and 2% at U.S. gas stations and select U.S. department stores. The 3% at U.S. supermarkets applies for your first $6,000 in purchases each year, then it goes to 1%, which is also what you earn on all other purchases. Additionally, you earn a $150 statement credit after making $1,000 in purchases within your first 3 months. Why we like it: This card's helps you get the most out of your purchases at gas stations and supermarkets. How to make the most of it: Log into your account online regularly to check out special offers from American Express; there are often deals with popular retailers that can net you even more savings on top of your regular cash back. Also consider: For an alternative that offers even higher cash back at U.S. gas stations but charges an annual fee, check out the Blue Cash Preferred Card from American Express. Most notable features: The Discover it Balance Transfer offers 18 months of 0% APR on balance transfers; unfortunately, its intro 0% APR only lasts for 6 months on purchases. However, in either case, the interest-free period is followed by a low regular APR of 14.24% - 25.24% variable. It does offer impressive rewards, with 5% cash back in rotating categories after enrollment up to the quarterly maximum and automatic cash back match at the end of your first year. Why we like it: This card's 18-month 0% intro APR offer on balance transfers is hard to beat, helping you stay interest-free into 2020 and beyond. There is also potential to earn a lot of cash back. How to make the most of it: As with any balance transfer card, make sure you pay off your balance before the introductory period ends, to avoid paying interest. Also consider: The Amex EveryDay® Credit Card from American Express† has a shorter intro offer on balance transfers, but no balance transfer fee. Most notable features: The BofA Travel Rewards credit card is a straightforward card that comes with handsome rewards. It earns a consistent and unlimited 1.5X points per dollar on every purchase, and provides a 25,000 point sign-up bonus for spending $1,000 in the first 90 days. Why we like it: With no foreign transaction fee and no annual fee, it's easy to use this card to earn rewards on international trips. How to make the most of it: Be mindful of how you redeem your points. Generally, you'll get the best value from redeeming points for travel purchases or as statement credits on travel purchases. Also consider: For a premium credit card with flexible redemption options, consider the Barclaycard Arrival Plus World Elite Mastercard. Most notable features: You can earn 30,000 bonus miles after a $1,000 spend within the first 3 months with this top airline card. Additionally, you get 2X miles on every eligible purchase made directly with Delta and 1 mile on all other eligible purchases. There's also a $50 statement credit after you make a Delta purchase within your first 3 months. Why we like it: Not only does this card allow you to earn miles for Delta purchases, it also features superb travel benefits. Along with priority boarding, the free first checked bag benefit on Delta flights is among the most generous of any airline card. How to make the most of it: Take advantage of the free first checked bag perk, and note that it applies to the cardholder and up to eight companions. Also consider: The Blue Delta SkyMiles Credit Card from American Express is a worthwhile alternative with no annual fee and a smaller, more attainable introductory bonus. Most notable features: With 1.5% cash back on all purchases, this offer is among the best credit cards out there and can translate into huge savings for businesses that make substantial purchases. With no annual fee, the Ink Business Unlimited offers a compelling value for any business, but especially small businesses. That's not to mention the $500 sign-up bonus after only $3,000 in purchases made in the first 3 months. Why we like it: The 1.5% unlimited cash back and large sign-up bonus means business owners can quickly rack up rewards dollars from using this card. How to make the most of it: To maximize your cash back, take advantage of the fact that you can add employee cards to your account at no additional charge and have them use their employee cards on business expenses. Note that you can easily monitor and set spending limits for each employee. Also consider: The Capital One Spark Cash for Business offers even higher cash back of 2% on all purchases, but charges a $95 annual fee after the first year. Most notable features: The Capital One Platinum accepts you even if your credit that's not the best, as low as a 580 credit score, making it ideal for credit building. If you pay it off in full and on time each month, you have a good shot at getting a higher credit line after your first 5 months of on-time payments. Why we like it: This card doesn't have the hidden fees that you'll sometimes find with a card that accepts fair or limited credit. And with no annual fee, the Capital One Platinum is our favorite among the fair credit cards. How to make the most of it: Set your own monthly due date and use the payment method that is most convenient for you (by check, online, or at a local branch). Also consider: For better rewards and a small annual fee, take a look at the Capital One QuicksilverOne. Most notable features: Earn 1% back on select everyday purchases such as gas, groceries, and services such as cellphone, internet, cable and satellite TV. This card is perfect for you if your score is under 670 on a scale of 300-850, and Credit One automatically monitors you to see if you qualify for a higher credit line. Why we like it: This card is great training if your credit isn't the best but you want to practice good credit card habits while earning rewards. How to make the most of it: It cannot be emphasized enough, pay your full balance on time every month. Only use it for purchases that you know you can pay off at the end of the month. Also consider: For a secured card alternative, consider the Capital One Secured Mastercard. Most notable features: College students can benefit from this card's 5% back on quarterly rotating categories after you activate, up to the quarterly maximum. Backed by one of the leading credit card networks, this is a great option for students looking to build credit without having to worry about an annual fee. The fact that Discover automatically matches all the cash back you've earned at the end of your first year is a huge bonus. Why we like it: This card is truly tailored for students. In addition to its generous cash back, it also gives students a $20 statement credit for each 3.0+ GPA school year for up to 5 years. How to make the most of it: Remain disciplined in your spending habits and do not be tempted into making extra purchases now that you have a credit card. That said, do use it on things you would ordinarily buy with cash, so that you earn cash back on fixed expenses and build up your credit history. Also consider: Take a look at the Discover it Student chrome and decide which rewards structure suits you best. Out of the 3,476 cards we analyzed to get to the top 17, here's how it broke down by category (certain credit cards overlap across several categories). Credit cards provide you with a line of credit that can be used anywhere credit cards are accepted. Credit is essentially borrowed money from the card issuer, usually capped at a dollar amount (known as your credit limit). All credit cards carry an Annual Percentage Rate (APR), also known as the card’s interest rate. You’re not obligated to pay your entire credit card bill in full every month, but if you carry a balance, you’ll accumulate interest based on your APR. Credit cards offer significant advantages over other payment methods. Ted Rossman, CreditCards.com industry analyst, points out that "the main reason to use a credit card instead of a debit card or cash is because credit cards offer lucrative rewards. Credit cardholders can easily get 1.5% or even 2% cash back on everything they buy. As long as you can pay your statement balance in full, it’s a no-brainer, because it’s free money." "Credit cards are also faster when it comes to checking out," says Randall Yates of The Lenders Network. "Debit cards require a PIN, adding precious seconds to a transaction." Consumers love credit cards, and usage is becoming increasingly common. In fact, Experian has found that over 59% of Americans hold a credit card. As of last year, Americans have 2.5 credit cards on average. 1. Your credit score is where it needs to be – This is a big one. Make sure your score is within the range of the card you are looking at. If you have a credit score of 550, there's no point in applying for a high-end travel card that requires a much higher score. 2. You don't have any upcoming loans to take out – It's generally a bad idea to apply for a credit card if you are about to take out a loan for, say, a car or home. It can appear to lenders that you are desperate. Instead, time your applications so that you give each one a cushion of several months. 3. You haven't applied recently for a loan or card – In the same way, you don't want to apply for a card immediately after you apply for another type of loan. Every time you apply for a lending product your score takes a small hit (although it's temporary, so don't despair). How do you qualify for the best credit cards? Your creditworthiness in large part dictates which credit cards you qualify for, and your creditworthiness is assessed with your credit score, a number that ranges from 300 to 850. The higher your score, the more credit card options are available to you. Think of your credit score as your financial report card. Lenders use it to decide what lending products to grant you and the terms of those products. For example, if you have a FICO score of at least 740, you have a greater chance of being approved for the best credit cards. Your credit habits are reported to the 3 major credit bureaus, TransUnion, Equifax and Experian, by your lenders. Those credit habits are used by credit score models FICO and VantageScore to assign you a score. Prospective lenders, landlords, insurance agencies and others look at that credit score to assess your creditworthiness. You are granted or denied lending products based in part on the score you've been assigned. There are two major types of credit score: FICO and VantageScore. As the dominant scoring model, FICO sells its scores for about $20 each. There are three scores available, one for each of the major credit bureaus – TransUnion, Experian and Equifax. (There is no need to check all three simultaneously.) Many credit card issuers offer free access to your credit score as a benefit of holding one of their cards. On-time payments, or payment history, figure heavily into the dominant scoring model, FICO, making up 35% of the score's criteria pie. Payment history is extremely influential in the VantageScore model. When it comes to using credit cards, a good rule of thumb is to only buy what you can pay for in cash within the next month. How much you owe compared to how much credit you have available makes up 30% of the FICO pie. It's highly influential in the VantageScore, while available credit is less influential. Total balances or debt are considered moderately influential. How long you have been building credit is a consideration to a lesser degree, making up 15% of the FICO scoring model. Age of accounts is highly influential with VantageScore. This metric makes up 10% of your FICO score, which means you'll want to avoid opening new accounts unnecessarily. VantageScore ranks this as less influential. Ten percent of your FICO score, you are encouraged to have a mix of credit types such as revolving (typically credit cards) and installment (such as mortgages and car loans). Credit mix is highly influential in VantageScore. As Brandon Ackroyd of Tiger Mobiles puts it, "Two things have served me well to build a strong credit score: making 100% of payments on time and keeping my credit utilization low." Our most recent survey on rewards cards found that 57% of U.S. consumers have at least one rewards card, whether travel, cash back or co-branded, so it's no surprise that new credit cards are entering the market every day. They might reward you for dining out, shopping at department stores, even making purchases at office supply stores. Used correctly, you can earn hundreds of dollars a year with them. There are basically 2 ways to earn rewards – with a sign-up bonus and with ongoing rewards. There can be other ways, such as signing up your first authorized user, but those are the most common ways to earn rewards. With a sign-up bonus, you usually are required to spend a minimum in order to get the bonus, and it will have a deadline – usually 3 months, but sometimes longer. So you might be able to earn $150 back after a $500 spend within 3 months, as in the case of the Chase Freedom card. The ongoing rewards are trickier. You can be rewarded for loyalty to hotel and airline brands; certain types of shopping; and loyalty to the card. Credit cards can be cash back cards or travel cards, and there are different types of both, including rotating categories, tiered categories and flat rates. Ways to redeem the rewards vary from issuing checks and statement credits to redemptions for travel and using loyalty miles for flights. Top credit cards tend to offer higher rewards and be more flexible in how you can redeem them. Credit cards offer a host of benefits, ranging from lost luggage reimbursement to access to the card issuer's travel portal. Here are some of the most common—and most compelling—benefits you can get with a top-tier credit card. Products such as travel cards, general-purpose rewards cards and cashback cards can provide superior savings with outstanding sign-up bonuses on most rewards cards, free breakfast at select hotel brands such as Hilton Honors, and even access to special events through such programs as Mastercard's World Elite program. Cards on the market today have a multitude of features and advantages, from no foreign transaction fee to U.S.-based customer service. Look carefully at what the cards you are eyeing have to offer, because the possibilities may surprise you. Remember to keep an open mind and carefully consider how much you could get out of an annual-fee card compared to no-annual-fee alternatives. The above example can be used as a guideline for conducting a basic cost-benefit analysis. Want to do more research? Check out our best credit card picks in popular categories like travel, cash back, and balance transfer. † All information about The Amex EveryDay® Credit Card from American Express has been collected independently by CreditCards.com and has not been reviewed by the issuer. The Amex EveryDay® Credit Card from American Express is no longer available through CreditCards.com. Laura is an editor and writer at CreditCards.com. She has written extensively on all things credit cards and works to bring you the most up-to-date analysis and advice. Laura's work has been cited in such publications as the New York Times and Associated Press. You can reach her by e-mail at laura.mohammad@creditcards.com and on Twitter @creditcards_lm. We encourage an active and insightful conversation among our users. Please help us keep our community civil and respectful. For your safety, we ask that you do not disclose confidential or personal information such as your bank account number, phone number, or email address. Keep in mind that anything you post may be disclosed, published, transmitted or reused. The comments posted below are not provided, reviewed or approved by the card issuers or advertisers. Additionally, the card issuer or advertiser does not assume responsibility to ensure that all posts and/or questions are answered.